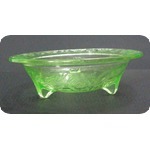 This beauty was made in the 1930's by the U.S. Glass Company in green. This pressed glass berry bowl was made in the Rose & Thorn pattern. It is not marked. It is 5 inches in diameter and stands 1 ½ inches tall. There are a few extremely fine chips missing on the inner rim of this bowl plus wear marks show on the feet. This one glows brilliantly under black light and deserves to be displayed under a similar setting. “Fire-King Sapphire Blue is the most well-known Fire-King pattern. Grandmas and mothers for generations have used this ovenware. Our moms and grandmas both used it as we were growing up.” – quote from Gene & Cathy Florence’s “ANCHOR HOCKING’S ®FIRE-KING & MORE” 3rd Edition. This is a lovely Sapphire Blue Table Server with tabbed handles manufactured by Anchor Hocking (1941 - 1956). It measures 10 3/8 inches from handle tip to handle tip and is 8 3/8 inches across the bottom. This piece IS NOT the light sapphire blue but the harder to find crystal clear item. 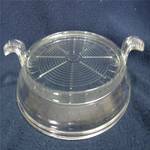 This will make a lovely addition to any Depression Glass collection for show or use. The glass is clear and free of any chips, nicks, or cracks. You are viewing an Imperial milk glass “Vintage Grape” footed candy dish. The candy dish is 7" tall, 5 1/4" wide at top, and is in excellent condition with no cracks, no scratches, no chips, and no fleabites. The candy dish does have the Imperial hallmark on the base and on the inside of the lid. The pattern vintage grape was made from 1950 to 1980. Two versions in milk glass were released, one a satin finish and this one, a glossy surface. Manufactured from 1941 until shortly after the close of World War II, this line captivated brides during the War Years and still captivates collectors today. 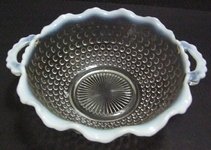 This listing is for a Hocking handled bowl done in Crystal with opalescent crimped edge and handles. 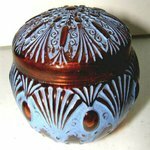 It stands approximately 2 3/8 inches tall and approximately 6 ½ inches in diameter (7 ½ inches including the handles). There is an extremely small chip on the base rim of the bowl. This piece is an outstanding example of American pressed glass from the 40’s. 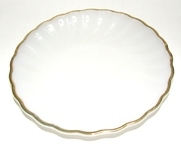 This is the Anchor Hocking Fire King Golden Shell design - White Swirled Saucer with 22kt gold trim made between 1949 and 1962. These saucers are about 5 7/8” inches in diameter and about 5/8” deep. The great swirl pattern is rimmed with 22kt gold trim in a solid pattern with NO glass layer over the top. Because there is no glass layer over the top of the gold, the gold has sustained minor wear, but still beautiful. These saucers have scalloped edges. The number on the bottom of each saucer may be the mold number in which it was made. Also embossed on the bottom of each saucer is “OVEN PROOF DINNERWARE BY ANCHOR HOCKING MADE IN U.S.A.”. These beauties will be wrapped individually in bubble wrap to insure their safe passage. This rare & very hard to find Julien Viard powder box is decorated with vines, pineapples and leaves with delicate scrolling on the lid. This piece was made during the very early 1900’s when Viard worked in his father’s glass shop. This amber gem has been painted a light blue to enhance its details. The paint is showing wear from handling which can be expected on items as old as this. Molded on the bottom is “J. Viard Made in France”. It measures approximately 4 inches in diameter and 2 1/2 inches tall. There is a small chip on the lid which I’ve tried to show in the pictures. It is not noticeable except under close examination. I rate this item as being a very good example of antique glassware. Please note: Shipment of this item will be via U.S.P.S Priority Mail with insurance. This listing is for a lot of nine (9) Park Lane cordial glasses by the Colony Glass division of the Lancaster Colony Glass Corporation, parent company to Indiana Glass in 1957. This pattern features multi-faceted pressed glass on the bowls with a square base. This lot consists of six (6) olive green pieces plus three (3) blue pieces. All nine are in excellent condition with no detected defects. 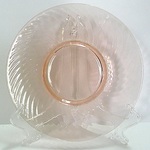 This listing is for a lot of 3 Imperial Glass depression era Twisted Optic (#313) pink 8" diameter luncheon or salad plates, which were made from 1927 - 1930. One plate has an extremely small “flea bite”; otherwise, no chips, cracks, or repairs. These are 8 inches in diameter and stand 1 inch tall. This is a clear 16 oz. 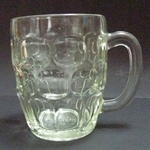 beer mug circa mid-Century America released by the Federal Glass Company in the Yorktown (Thumbprint-style) pattern for advertising Winston cigarette products. It stands approximately 4 7/8 inches tall by 3 ¾ inches in diameter at the mouth. It is a very solid piece of glass. Embossed on the grained base is the word “Winston” visible when looked at on the inside. This piece is without chips, cracks or any visible defects. 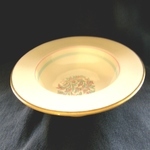 This listing is for a gorgeous ROSSMORE pattern China rimmed Soup Bowl by Franciscan Pottery of Southern California. This is a piece of beautiful creamy white china with a turquoise and pink pattern and 22KT gold accent on the rim. The interior bowl is highlighted by a pink stripe encompassing the interior rim with a turquoise stripe further down in the interior bowl. Each bowl measures 8 ¼ inches in diameter by 1 ¼ inches deep. These bowls are all in pristine condition. I do not believe that they have ever been used. There are 15 bowls available so buy one, buy two, buy six or buy fifteen. Asking price is for a single bowl. I will offer a price reduction on a purchase of multiple bowls. Shipping cost is for a single bowl - if you order more than one bowl, wait for an invoice with the correct shipping cost. 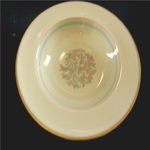 This listing is for a gorgeous ROSSMORE pattern rimmed Dessert Bowl by Franciscan Pottery of Southern California. This is a piece of beautiful creamy white china with a turquoise and pink pattern and 22KT gold accent on the rim. The interior bowl is highlighted by a pink stripe encompassing the interior rim with a turquoise stripe further down in the interior bowl. Each bowl measures 6 ¼ inches in diameter by 1 ¼ inches deep. These bowls are all in pristine condition except for 1 bowl which does have a chip missing from rim (see pictures). I do not believe that they have ever been used. There are 13 bowls available so buy one, buy two, buy six or buy thirteen. Asking price is for a single bowl. I will offer a price reduction on a purchase of multiple bowls. The first single purchase of six bowls receives a bonus of the quilted zippered storage pouch pictured. Up for sale is a very heavy hand blown crystal art glass vase, approximately 4 ½” tall X 4 ¼” wide X 2 ¾” thick, with a puckered rim. 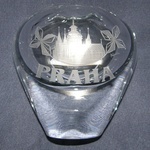 There is an exquisite detailed engraving of the Prague Castle plus matching pinwheels on either side of the engraving. Under these engravings is the Czech word “PRAHA” or Prague. The overall design is reminiscent of the Strombergshyttan art vases by GUNNAR NYLUND who designed most of the Strombergshyttan collections from 1952-1975. There is an engraved signature under the right pinwheel which is similar to the signature seen on similar Strombergshyttan vases found on the Internet. You are viewing a mid-Century Corinthian Blue beverage set by the Jeannette Glass Company consisting of eight (8) 10 oz. straight tumblers plus a matching glass ice bucket. This is the rarer blue. The design is a Wedgwood-like blue with white Hellenic or Greek characters. Each piece is adorned with gold along the upper rim. The glasses measure 5 inches tall and hold 10 ounces of liquid. The ice bucket also measures 5 inches tall. The brass stand that came with the set to hold the bucket is missing. All pieces are in very good condition with no chips or cracks. The painted design is very good and crisp. 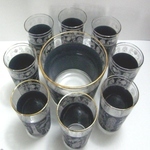 There is wear to the gold on the rim as can be expected on used glassware. 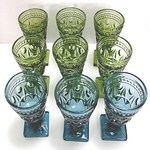 This set will be great for the Jeannette, Wedgwood, Blue or vintage Beverage Glass Collector! “I do not profess to be an expert on Glass, Glassware, Silver, etc. and the descriptions put forth are the result of research on each item listed. I rely on a variety of sources for my descriptions. If you feel that I have incorrectly described or misrepresented an item, feel free to contact me with corrected information and I will make adjustments as necessary. Please view all photos carefully and ask questions. All items that I sell are used, unless noted, and are sold ‘AS-IS’.